In the years leading up to the much-hyped release of No Man’s Sky, which launched yesterday, director Sean Murray talked several times about players being able to spot one another in the wild. So why hasn’t that happened yet? 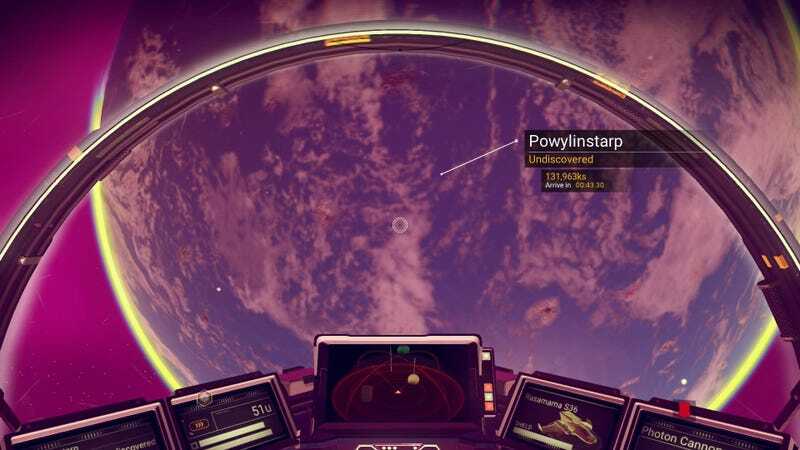 Yesterday, two No Man’s Sky players found that they were in the same region of the game’s massive universe, and they both live-streamed their attempts to meet up. Yet no matter what they tried—meeting near a planetary outpost; meeting on a space station; meeting in space—they just couldn’t see one another. At one point, one of the players realized that he didn’t have PS Plus, so he logged off and signed up for Sony’s premium service—still, nothing. Colbert: Do we ever get to see ourselves? Murray: No. You don’t see yourself, so the only way to know what you look like is for somebody else to, you know, to see you. Colbert: Can you run into other people, other players in the game? Murray: Yes, but the chances of that are incredibly rare, just because of the size of what we’re building. In other interviews, Murray repeated that same point several times, telling media outlets that it’d be unlikely for two players to see one another, but that it could definitely happen. So what was going on? One thing that was clear, while watching players Psytokat and SadCactus stream their encounter, was that they were both in their own instances of the planet. When one player paused the game by entering the menu, the movement of foliage paused with him. When one player tried destroying terrain with a grenade launcher, the other player couldn’t see it. Murray and Hello Games didn’t return a request for comment last night.